The Hen Who Dreamed She Could Fly is a novel which was written by Sun-Mi Hwang of South Korea. This novel has garnered critical and international acclaim. It has been called a "fable-like tale" and I can certainly see how that would be. In The Hen Who Dreamed She Could Fly we meet a hen who has named herself Sprout. She is an old and sickly hen who is having troubles laying eggs. She overhears the farmer and his wife discussing the fact that she has fulfilled her purposes and eventually is shocked to discover herself being disposed of. Sprout manages to do what the other hens - those who have also outlived their purpose for humans - do not manage to do. She escapes from the group of dead and dying chickens and begins making her own way around the farm yard and surrounding world. Her constant greatest wish is to be able to lay and egg and hatch it. Critics will tell you that this story is about self-realization, death, and the achievement of happiness. I will tell you that it is an interesting story about a hen that is neither totally captivating or entirely easy to forget. I do think this book has fable-like qualities to you which cause you to remember it and draw any number of personal applications from it. I believe each reader could potentially experience something different when reading this book. When I looked up the reviews on Good Reads I noted that the opinion was that, as the cast of characters here are all animals, this book will make you think about Animal Farm or Charlotte's Web. I didn't find that to be the case for me. I didn't think about either of those books when reading The Hen Who Dreamed She Could Fly . This story is less detailed and charming than Charlotte's Web. There is no strong political argument being made in this book which would bring to mind Animal Farm. This book by Hwang just seems a simple story which you will either enjoy or not. I guess what I'm saying is, I think that entirely too much has been made out of this book. It has been overdramatized which risks the enjoyment for future readers who might expect this book to revolutionize their world only to discover themselves a bit used by marketing firms. It really is ok to be an adult and read children's stories for fun and amusement. And when you do so, you might find that children's stories hold a unique value all their own in that they appeal to simple understanding and imagination. Simplicity can be beautiful and has the potential and power to communicate great truth. We adults try too hard to make things become and stay complicated. Somehow we've made ourselves to believe that when we've made something complicated we will then feel freedom to enjoy whatever it is (...if we can). Forced complexity is just a pretense and it usually exists for the purpose of to hiding some insecurity. In my opinion we should always be free to read a good children's story. And then we should be free to admit it. 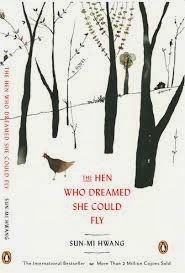 Did I enjoy my reading of The Hen Who Dreamed She Could Fly ? Why, yes I did. And I'm not ashamed to say so. Would you also be interested in also reading a copy? Penguin Group has generously offered to give away one copy of this title to one of you. Care to win? Simply leave a comment below including a valid e-mail address. This contest is open to U.S. Residents only and will be open through Monday, December 16th. THIS CONTEST IS NOW CLOSED. THE WINNER, as selected by Random.org, IS #4 - Annette! Congrats! Many thanks to Penguin Group who sent a copy of this title my direction in order to facilitate this review. I have received no additional compensation for this post and all opinions are my own. How odd that someone would have to justify reading a children's tale. I thought it was only teenagers who felt such stuff to be beneath them. Would love to win another book to add to my children's bookshelf. It sounds like a very touching story. I would love to share it with my daughter. Thanks for having the giveaway. It arrived today! Thank you!